Not to be confused with the mouthwash, Listeria is a bacterium that can be found in food and make those who ingest it ill. In the news there have been several stories of food being recalled after this bacteria had been found wherever the food was manufactured. Most recently, stories could be found in the news about Nestle recalling drumsticks, Blue Bell recalling ice cream, Eggo waffle recalls, and grocery stores that were recalling pasta and potato salads. In a horrific turn of events, even some brands of bacon were recalled. 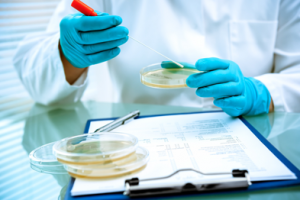 Listeria, while an important health problem in the United States, is actually not that common. However, it can be deadly if certain people get this disease. It is caused by eating food contaminated with Listeria monocytogenes. While healthy people that eat food contaminated by this bacterium are rarely at risk, pregnant women, newborns, the elderly, and those with weak immune systems are all at risk. The disease makes itself known with fever, muscle aches, stiff neck, or chills. Treatment for it is antibiotics. The guidelines for preventing a Listeria outbreak are similar to those for any other foodborne illness, such as salmonella. For starters, it is very important that fruit and vegetables are washed when brought home from the store. They should be stored in a separate location from ready-to-eat foods, deli meats and cheeses. It is also important that all meat is cooked thoroughly to a safe internal temperature. A good disinfectant should be used on surfaces where food is prepared and keeping hands clean is extremely important. When lathering up with soap, make sure you are washing for at least 20 seconds to properly clean your hands and kill bacteria. By keeping your kitchen and your environment clean, you keep it safe. In the battle against bacteria, sanitizing and disinfecting are your greatest weapons.